Eric Matzner tells me he takes 30 to 40 pills a day. He is 27 and perfectly healthy. Thanks to the pills, he says he hasn't had a cold in years. More importantly, the regimen is supposed to optimize the hell out of his brain, smoothing right over the ravages of aging, sleep deprivation, and hangovers. Matzner is the founder of Nootroo, one of the many companies now purveying nootropics, or brain enhancement drugs. Depending on who you ask, nootropics could include everything from Adderall to caffeine, with an array of unregulated and largely untested chemicals like noopept in between. 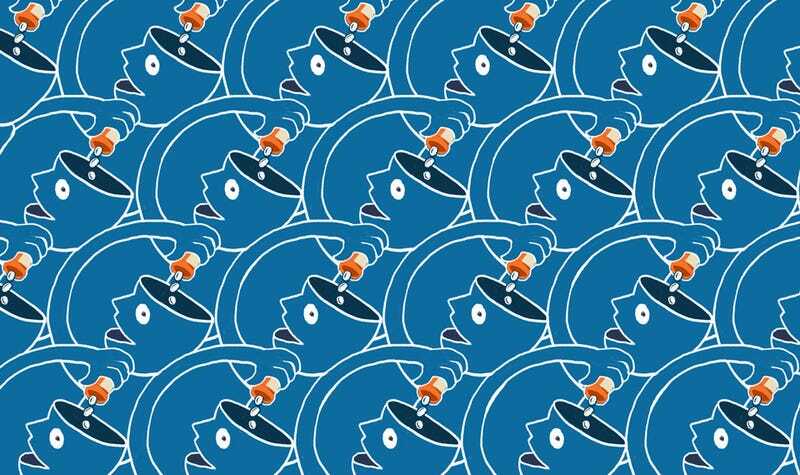 The idea of nootropics has been around since the 70s, but it's enjoyed a recent swell of popularity, especially among the Silicon Valley bodyhacking and Soylent-guzzling set. It's tempting to dismiss a lot of this stuff as pseudoscience and snake oil because c'mon, have you read anything about the supplements industry lately? But if you peer through the hype around nootropics, there is something interesting afoot, too. Online communities coalescing in forums like Longecity, Bluelight, and especially the subreddit /r/nootropics have become a massive crowdsourced science experiment. Their DIY science is very imperfect, but these self-experimenters have found a legitimate gap in the drug industry: Brain enhancement drugs for healthy people don't fit neatly into an FDA category, giving little incentive for pharmaceutical companies to test these drugs. Self-experimenters are going where pharmaceutical companies don't dare go—yet. Like all categories vague and ill-defined, exactly what counts as a nootropic can depend on who you ask. The most familiar substances are ones that have sparked the most handwringing media coverage about abuse: Adderall, Ritalin, and modafinil, the wakefulness drug given to Air Force pilots during long missions. Some nootropics enthusiasts contend that drugs like modafinil—with dramatic effects and potentially dramatic side effects—do not count as nootropics. Or at least, they misrepresent nootropics, which include drugs that have a small but cumulative effect over the long term by optimizing cognition. "The right analogy is compound interest. You're not going to make a million dollars in a day," says Michael Brandt, cofounder of the company Nootrobox. "If you can be 10 percent more productive over the course of your 20s, the amount of throughput you can achieve is phenomenal." Other popular nootropics include the herb Bacopa Monnieri to enhance memory, the peptide noopept to combat cognitive decline, and L-theanine, an amino acid commonly found in tea. Nootropics could be plant-derived or synthesized in a lab. There are many, many more listed in /r/nootropics's truly impressive FAQ for beginners. But two cognitive enhancers it recommends the most are—ready for it?—caffeine and L-theanine. In other words, coffee and tea. Groundbreaking, right? Moderator MisterYouAreSoDumb told me that a program to test the drugs was organized, which would make sure they actually contain the ingredients listed on the labels. A couple of well-known vendors donated money to do the tests, which are usually done at a chemistry lab in Tennessee called Colmaric Analyticals. To be fair, Redditors sometimes do blind themselves in comparisons with placebos, and blind placebo-controlled trials and even been sporadically attempted. But a pseudoanonymous internet forum with participants flung all over the globe is not exactly the best place for trials that need to keep track of dozens, potentially even hundreds, of people. Confounding factors, aka all the outside influences that can affect the outcome of a study, are also hard to weed out in single-person studies. For example, work can be incredibly stressful the week leading up to a big launch, and then easygoing the week later. Depending on which week you do a brain test, your results will be very different. Clinical trials, however, enroll as many people as logically feasible, so that these confounding factors are averaged out. At the same time, most of these substances are so new that there aren't many longterm studies, especially in healthy 20-somethings. Suppliers of nootropics are of course well poised to exploit this ambiguity. When it comes to clinical research and regulation, nootropics largely exist in a gray area. "In the US, we don't have categories for enhancement. Even if they have trials that exist, there is no FDA category for them," says Matzner. And he's right. The FDA is set up to approve drugs for treating disorders. You have Adderall for treating ADHD or modafinil for narcolepsy. It does not, however, have any framework for regulating drugs optimizing the brains of the perfectly healthy. If drug companies who don't see a clear path for getting a new class of drugs approved, why risk all the money into developing one?